The Greeneville City Schools (GCS) Education Foundation is accepting public nominations for its 7th annual CORE Champion Awards through January 28, 2019. 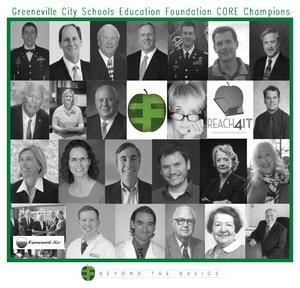 The Greeneville City Schools (GCS) Education Foundation is accepting public nominations for its 7th annual CORE (Commit, Optimize, Reinvest, & Equip) Champion Awards through January 28, 2019 in the categories of Outstanding Young Alumni, Distinguished Alumni, Distinguished Service, and Outstanding Patronage. The winners of these awards will be introduced at the Education Foundation’s 7thannual CORE Champion Awards Banquet, to be held in April 2019. The event will honor alumni and friends of the Greeneville City School System. CORE Champions will be honored for their commitment to the service to others, their ability to optimize resources, reinvest in the community, and equip others to be successful. The selection committee seeks to review the broadest possible range of qualified nominees. Outstanding Young Alumni Award will be granted to a Greeneville High School graduate who is 40 years old or younger when nominated, for significant accomplishments in their profession or chosen field of endeavor or for distinguished human service to their community, state, or nation, thereby providing students with an outstanding role model. Distinguished Alumni Award will be granted to a Greeneville High School graduate for their achievements, contributions, or service that benefits humankind and brings honor to the Greeneville City School System. Distinguished Service Award will be granted to an individual (alumni or non-alumni of Greeneville High School) who has demonstrated outstanding service and dedication to education in the town of Greeneville. Outstanding Patronage Award will be granted to a benefactor (alumni or non-alumni; individual, family, or entity) exemplifying outstanding dedication and patronage to public education. The awardee is deserving of recognition for their spirit of giving not only to the Education Foundation, but also to the youth in our community. Nomination forms must be emailed or postmarked by January 28, 2018 in order to be considered for the 7th annual CORE Champion Awards. All nominations should be directed to Amanda Waddell, executive director. The completed nominations packets can be emailed to Waddell at waddella@gcschools.net , or mailed to GCS Education Foundation, P.O. Box 1420, Greeneville, TN 37744. For additional information about the CORE Awards and the nomination process, contact Waddell at 423-823-0001.